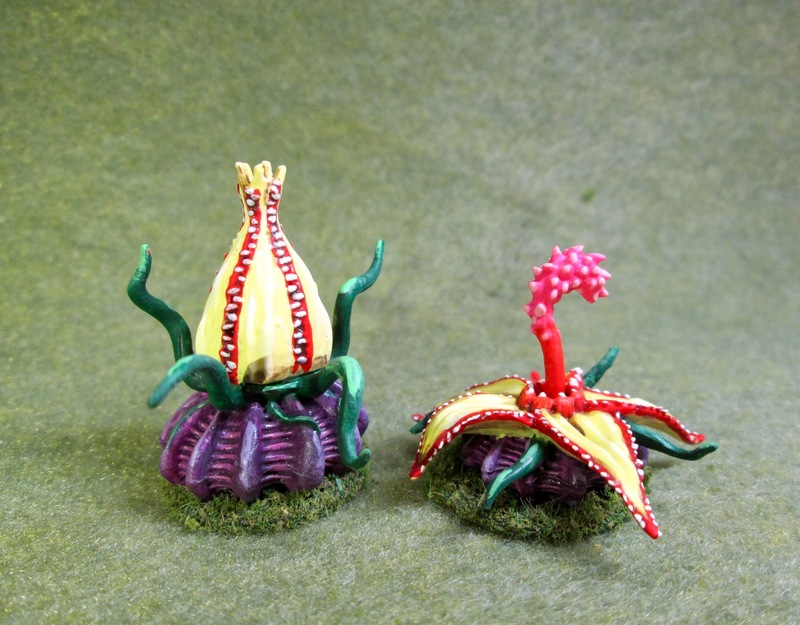 Death Star Lilies: Bones 3 Figures | H.A.W.K.S. 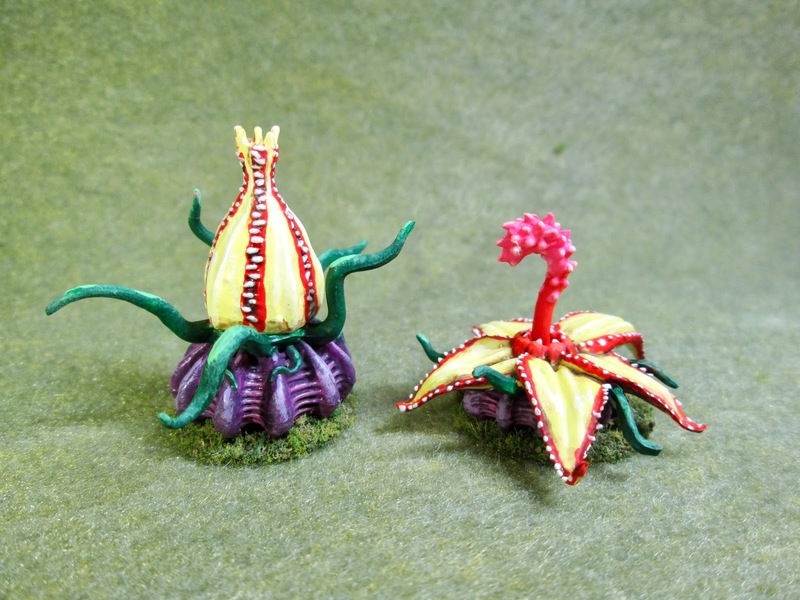 This past week I began work on my new Bones 3 stuff, and to start painting I chose the pair of Death Star Lilies from the Stoneskull Expansion set: something not too complex, yet colorful, and fun to work on. 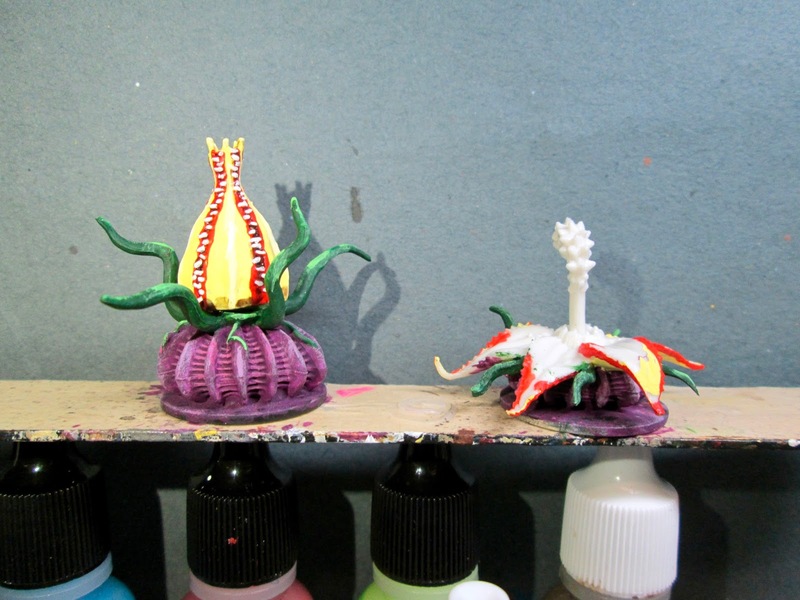 I began by painting the bottom potions of the plants with Crafter’s Acrylic “African Violet”. 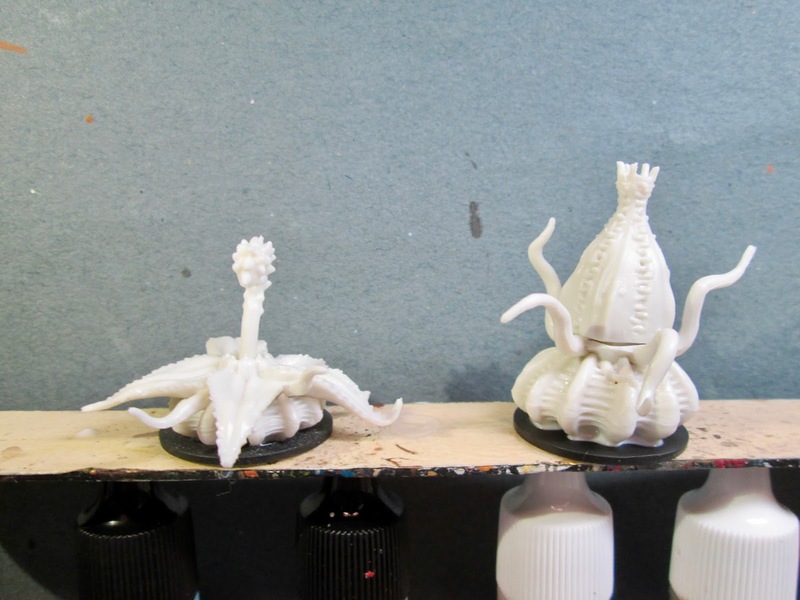 When dry, I drybrushed the ridges and spines with Apple Barrel “Apple Lavender”. I then painted all the tentacles with Reaper MSP “Christmas Wreath”. Next, I painted the petals, (the outside of the petals specifically on the opened lily), with Crafter’s Acrylic “Daffodil Yellow”. I then painted the edges of the petals with Reaper MSP “Holly Berry”. 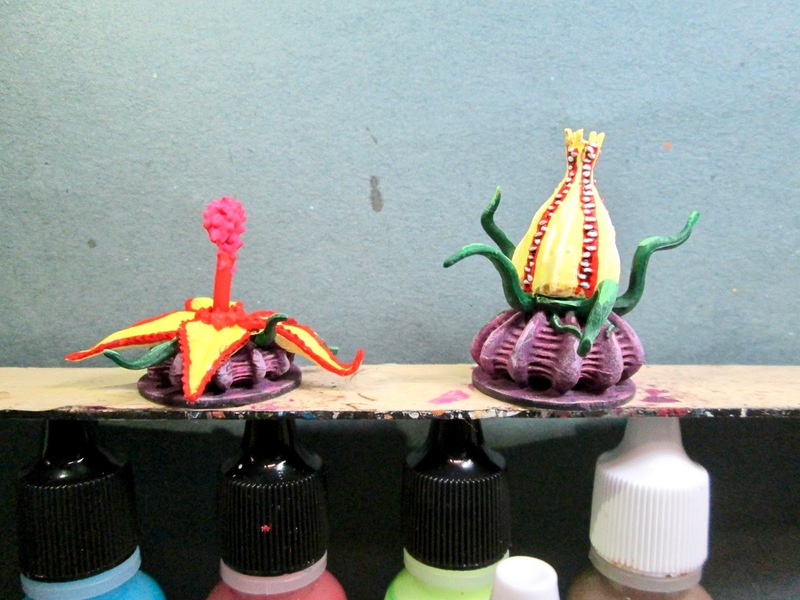 After the “Holly Berry” had a while to dry, I ran some Citadel “Agrax Earthshade” wash down the seams between the petals on the closed lily. When the wash was dry, I highlighted the petals with Apple Barrel “Lemon Chiffon”, and some plain “White”. I then used the White to paint all the little teeth running down the edges of the petals. 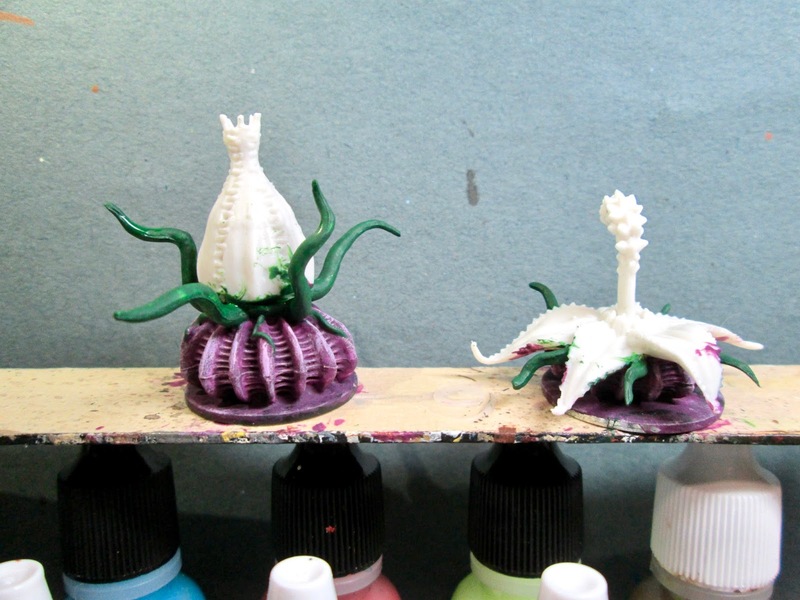 After that, I highlighted the tentacles with Crafter’s Acrylic “Wild Green”. I then worked on finishing the open lily. I begn by painting the inside of the petals with Americana “Margarita”. After that, I fixed up the petal edges with the “Holly Berry”, and also used this color to paint the central circle of the plant, and the pistil. While the “Holly Berry” was still wet, I blended it with Crafter’s Acrylic “Tutti Frutti” to paint the end of the pistil. I let everything dry for awhile, and then once again, I ran some “Agrax Earthshade” wash down the edges of the petals, and also applied some to the central circle where the bases of the petals met. When this wash was dry, I highlighted the central circle at the base of the pistil with some Crafter’s Acrylic “Pure Pumpkin”, and the bumps on the pistil with some Crafter’s Acrylic “Cherry Blossom Pink” I then highlighted the inside of the open petals with some of the “Margarita” mixed with some White. I then painted all the little teeth along the edges of the petals with White. Lastly, I painted the washers with some Ceramcoat “Walnut”. I’m quite pleased with how these plants came out. I think they have the right blend of joyous color and sinister intent. Very nice! It gave you a chance to use all those crazy colored paints that don’t get used often! Thanks, Buck! Yes, that was part of the fun of painting them. Absolutely love these ESPECIALLY the bright colors. Great for sci-fi!